You and a group of your friends will begin your experience being locked in a room. You will then have only 60 minutes to search your surroundings, find the hidden clues and solve the puzzles in order to escape. Wits, imagination and teamwork are needed or you will be Trapped! 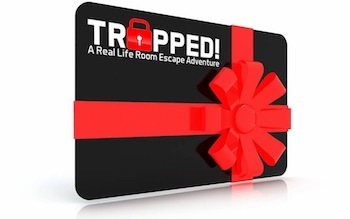 Real-life escape room adventures are a mix of physical and mental adventure games in the which people are placed in a situation where they need to interact with their environment in order to complete a series of puzzles, find the clues, achieve the goal before the time runs out. Why choose Trapped! Escape Room San Dimas? This escape room was one of my favorite ones my friends and I have done so far and we go all over Southern California. Room: Operation X-13 was an engaging room that really gave an immersive experience due to the creativity of the puzzles, and our game keeper Daphne who made the escape room so much better. Everything in the room was perfect in detail and there were puzzles we had to solve I have not seen elsewhere. Don’t want to spoil any of the puzzles but we did really love this room! Service: Our group could tell how passionate the team members here were about the rooms they had and it was unique to hear that all of the rooms they have are connected to each other like a story line! If we’re in the area again we’d definitely try the others. Parking: Parking was super easy to find and plenty of space available. As someone who’s been to escape rooms in LA this really is important since being late can really cut off from your experience and be a Debbie downer if it’s because of parking. Overall I’d highly recommend trying this room before doing the sequel to the room which is located in their Upland location. Trapped! Escape Room San Dimas is one of the best escape rooms in all of Los Angeles County. We have been in the escape game industry since 2015 and have just recently expanded to San Dimas. This location is better suited for our customers living in LA, Pomona, and West Covina. If you’d like to learn more about the experience we provide, check out our individual room pages for more information. Let us know if you have any questions before booking, we’d be happy to help!